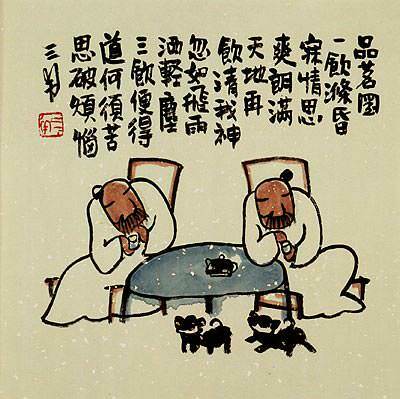 Silk/Brocade: 62.2cm x 158cm ≈ 24½" x 62¼"
This depicts men enjoying tea. 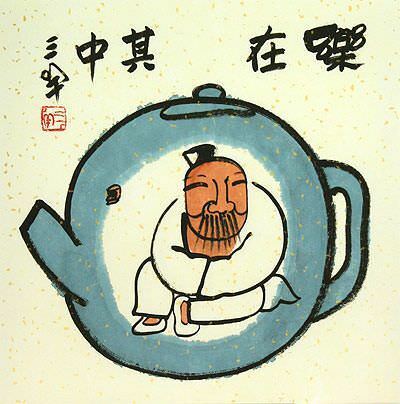 The title suggests that it is a quality white tea (tea made from very young leaves). 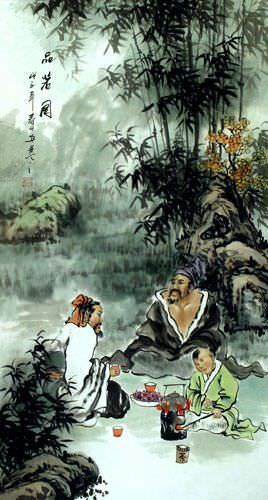 In the foreground, these two noble men have a servant boy tending the fire and brewing the tea for them. 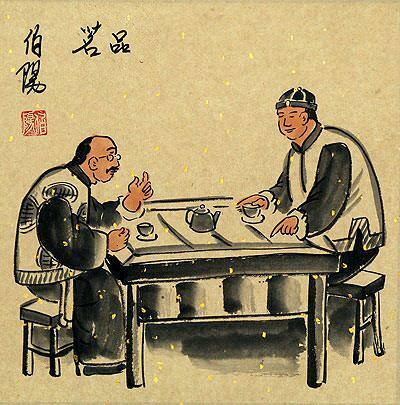 The scene suggests that these men are enjoying the tea and discussing philosophy or poetry (very common activities in ancient China before TV was invented). 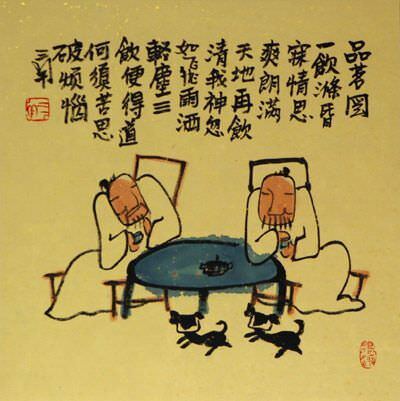 After the title "Quality Young Tea Leaves", the rest of the Chinese characters indicate the year painted (2008) and the artist's signature. 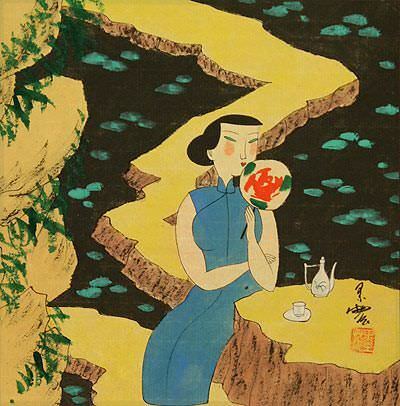 This was painted by (Shou Shi) from Guilin, China. This artist happens to also be a master calligrapher. 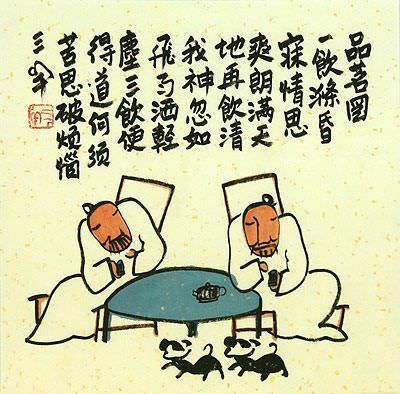 Both his calligraphy and artwork are of excellent quality. 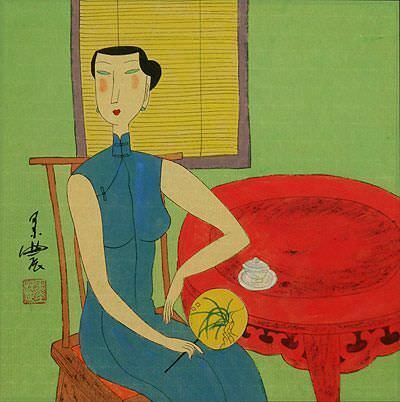 He happens to be a friend of artist Ou-Yang Guo-De, and was introduced to me in 2007. We make our own handmade wall scrolls at our workshop in Beijing. Each one is carefully made with high-quality materials. Learn more here: Asian Art Mounting Workshop.